For our second day of sketching the group expanded. Isabel and I were joined on the sea wall by Julia and Eva. Painting on the rocks always makes me a bit nervous, since I imagine my good brushes tumbling down into the crevasses and me not being able to retrieve them. For that reason, I took one brush out at a time and put it back in the case before taking out another one. A bit neurotic for sure but I left with as many brushes as I started with. 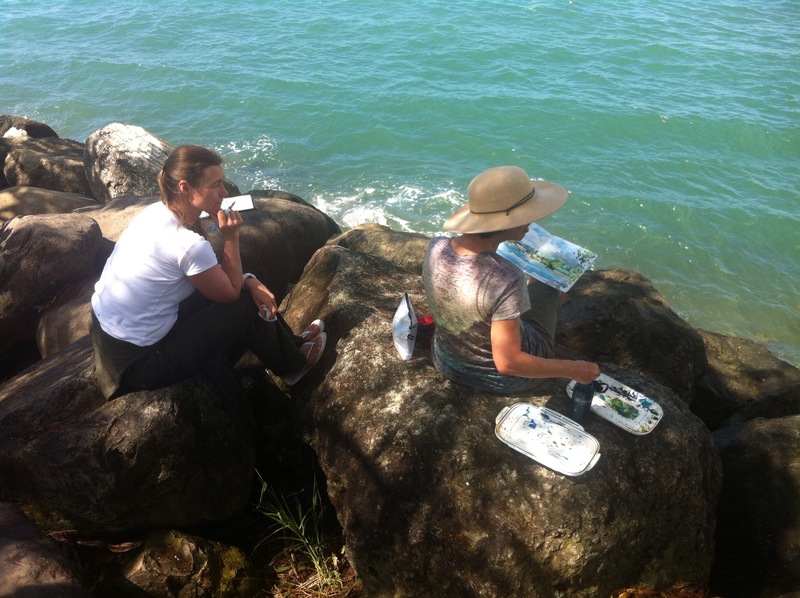 It was a beautiful scene to paint. 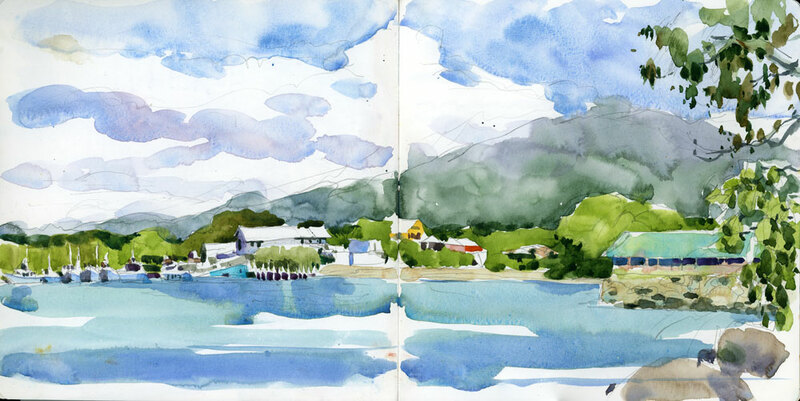 Clouds merging with distant mountains, layers of greenery both warm and cool, a row of light coloured buildings with bright accents and some turquoise water. It’s the kind of setup I always seek out but seldom find. 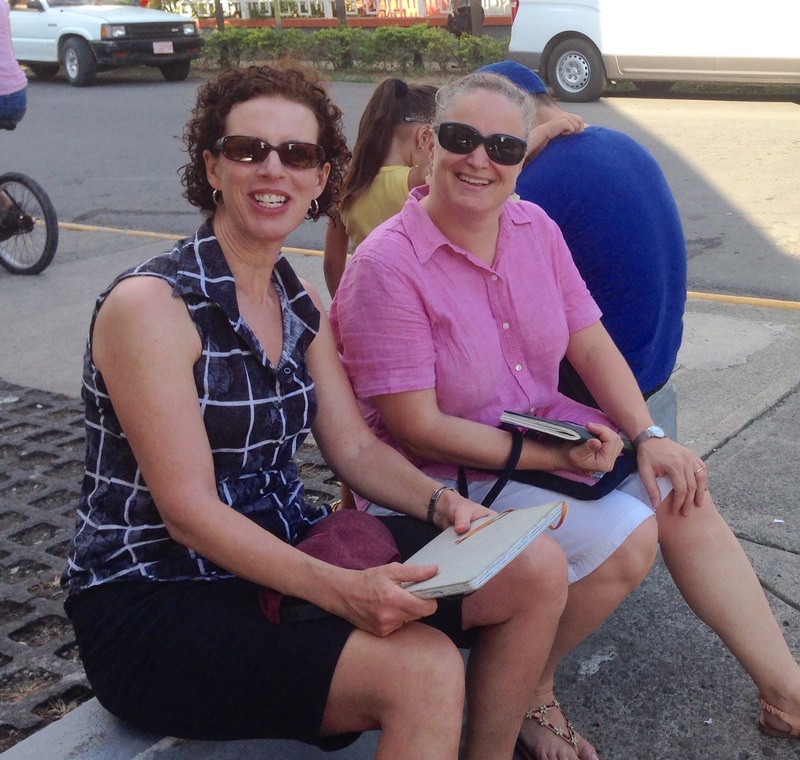 Of course there was a customary coffee break after the rock sketch — we are in Costa Rica, after all — and then a second sketch on a side street where we sat in the shade of a giant Costa Rican Christmas tree and faced a row of shops and bars. 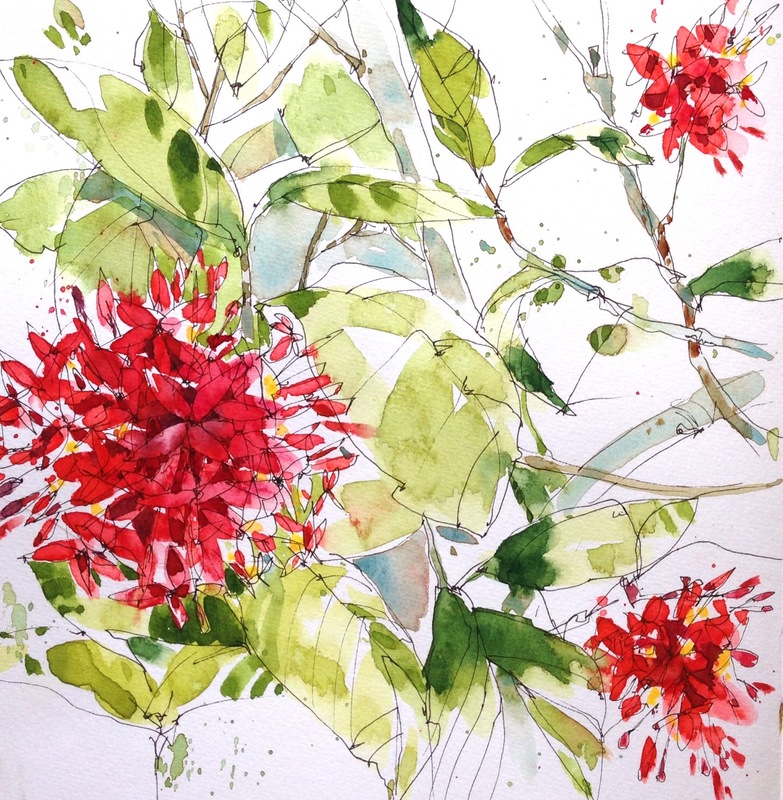 I loved my Quepos sketchcrawl so thanks to Julia and Isabel and Eva for the hospitality! 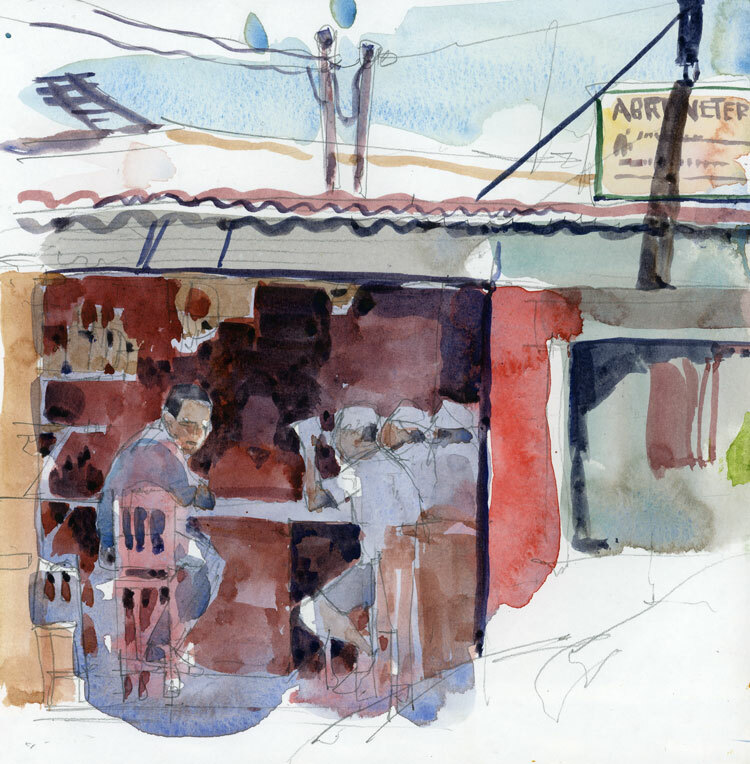 One of the most wonderful aspects of urbansketchers.org is knowing that in almost every place you go in the world there will be other sketchers you can connect with. 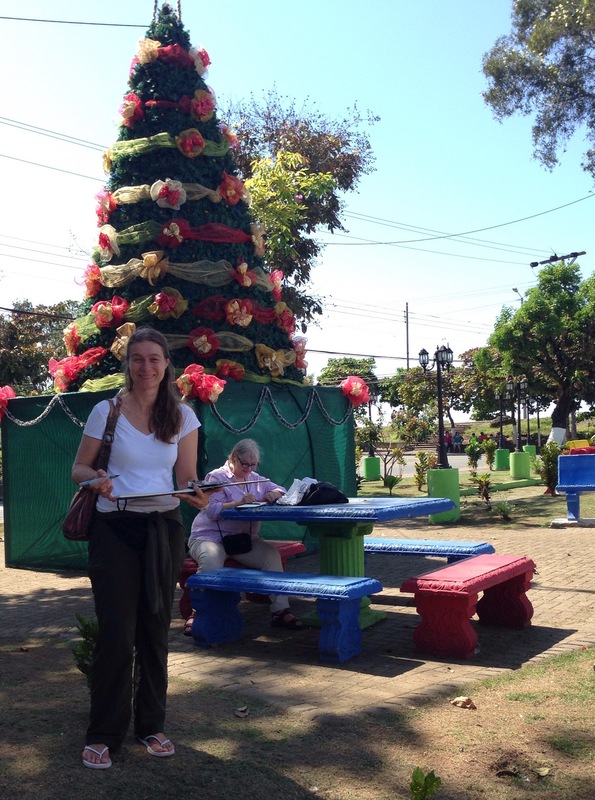 I was very excited when Costa Rican sketcher Isabel Niehaus (have a look at her wonderful sketches here) contacted me a few days ago and drove down to Quepos from San Jose to sketch with me.We were joined on our outing by my friend Aislin, our unofficial guide, as well as a student in landscape architecture. 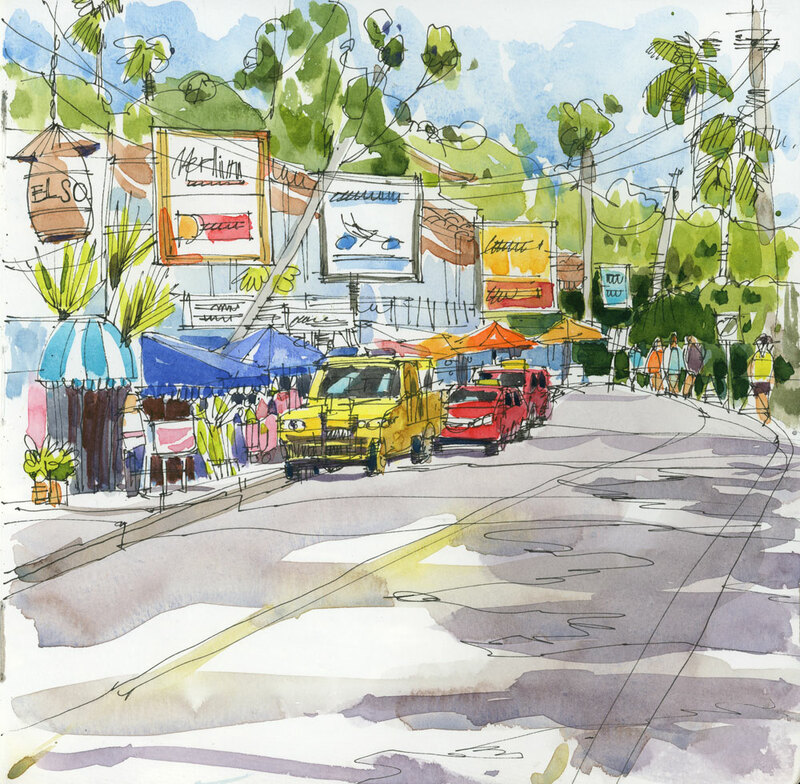 With its colourful buildings and busy street life, the town of Quepos has no end of sketchable scenes. We found a low concrete wall to sit on, and from there we had a great view of the end of day light on the buildings. And of course we had to end our sketchcrawl by lining up all the sketches on the street and taking a photo. 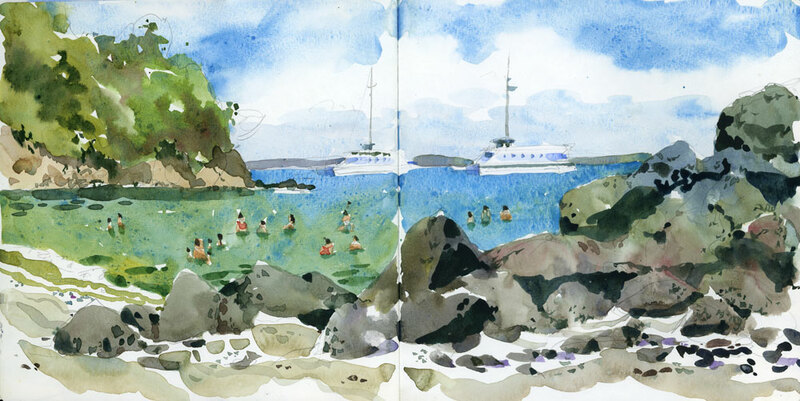 I’ve sketched and painted this big rock three times since I arrived in Costa Rica (I’ll post the paintings when I get home and can scan them) and I’ve realized a few things about using it as a subject. 1: I always need to add a few people to give it scale. 2: It’s so big that it’s really hard not to have it in the middle of the page. That’s difficult for me since I often compose using the rule of thirds. Fortunately there’s so much going on in the rock itself that it’s not just a dark shape in the centre of the page. Every time I open my palette to paint, the blobs of colour in the different wells have moved around on their own. The blues seem to be the worst offenders. Cerulean and Cobalt Teal are now on the lid and Ultramarine has slid across into another well. It’s my own fault. I should have filled the palette at home and let the colours dry for a few days before packing. Instead, I brought along tubes and refill the colours every few days. Because the palette is shiny plastic, and due to the high heat and humidity, the blobs of paint just slide across the surface, creating a bit of a mess for me. 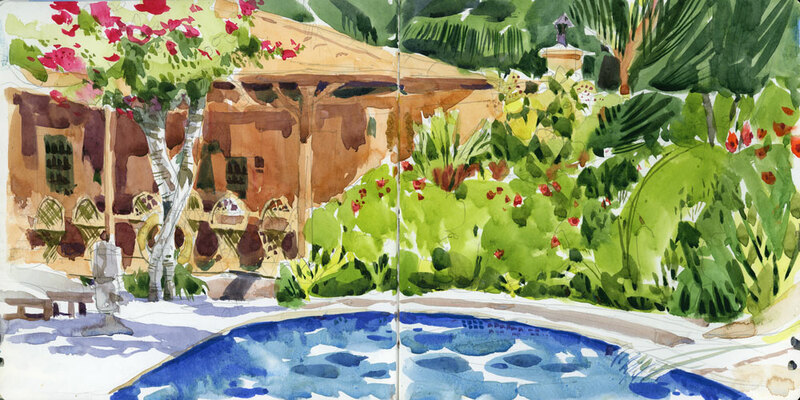 Fortunately, in these surroundings, there’s lots of reasons to use blues, including sketching the pool, which is a first for me. You really have to know someone or be a local to find Playa Beisanz. Walk two kilometres down from the main road and when you see a path and a small opening into the rainforest through a cut in the barbed wire fence, you know you are on the right track. 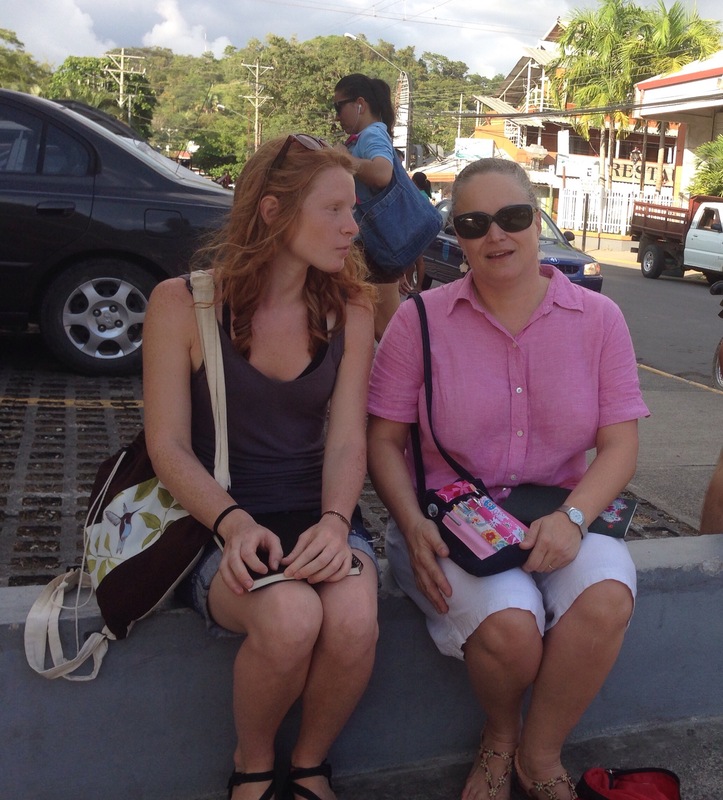 Pass the howler monkeys and a sloth or two, and when you smell the meat cooking on the portable grills, you know you are there. Well maybe the grills are just for Christmas day celebrations. I’m not sure. The beach is small, the bay is calm and the scene under the trees is like something from a Gauguin painting, except with grandmas and babies. And when the last of the feast has been consumed, it’s time for a swim. 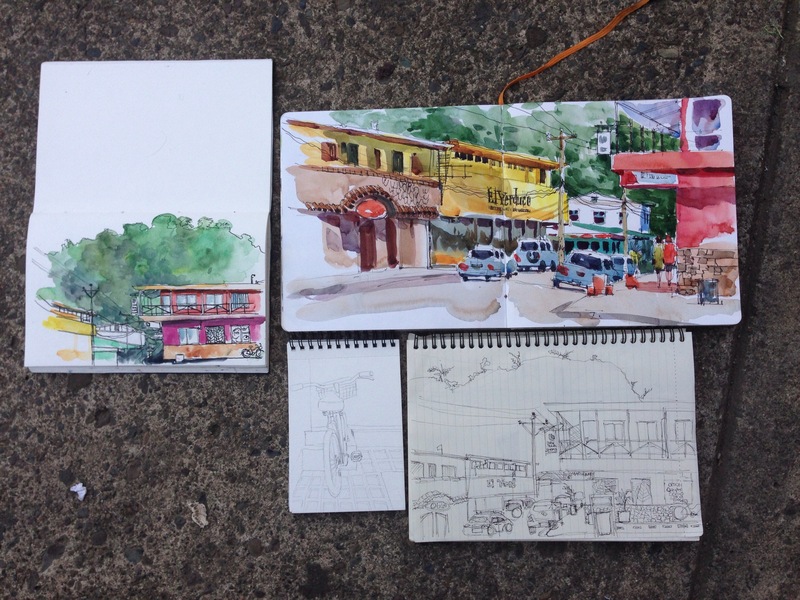 Sketching in the little town next to Playa Manuel Antonio brought back memories of the first Urban Sketchers Symposium I attended in Santo Domingo. I drew this while standing on the sidewalk, buses and taxis and cars honking, vendors shouting all around, tourists crossing in front of me on their way to the National Park and the sun blazing down — much like drawing in front of the market in Santo Domingo. I remember how nervous I was the first time I tried to sketch in the middle of this noisy chaos. I couldn’t imagine how all these Urban Sketchers were able to tune it all out and to focus on the lines they wanted to put down on paper. It seemed thrilling and marvelous and unimaginable to me. It became easier in Barcelona at the next Symposium I attended. And then while drawing this I realized that it has become second nature to stand in a crowd and draw. The nervous jitters are gone and all that is left is the thrill of standing in the middle of the chaos and trying to capture some of it on paper. I want to wish everyone a very wonderful holiday and a happy and healthy New Year with many days of sketching for you wherever you are. Once again, this has been a great year to meet people both in person and through the blog, and I am grateful for that. All the best for the season!